A week has gone by since my big ride of the year. I came back from such a huge bike ride trip with a weight gain. Yes, I may have burnt a zillion calories climbing a mountain and riding a century... but the eating out, the road trip habits, they body trying to retain water to repair itself all added to a weight gain. I left weighing 192lbs and came back weighing 204lbs. Insane. Things I learned... road trips = bad choices. At least in the past. I am going to make it different from now forward. This trip at pee breaks, and gas stations turned into Sweetarts, trail mix (with M&M's and chocolates,etc) just a load of crap. This weekend I have another road trip and I am planning ahead. Presliced fruit will be the key. It's sweet and good for the body. Smarter choices at restaurants too.... .I love food too much. I just can't fall back into my old self of fried foods - it is just not healthy for my body. The other thing I came to realize is after a big big ride (or any other huge exertion) that the body does what ever it can to protect it self and start repairing (gaining weight and retaining water). That's good for the body - but bad for the mind when you stare at a number on the scale. The good news is that a week after, I am actually back to where I started 192. It does seem to be coming back down in big jumps again and I am anxious to see where it will stop again. Hoping to see a new low before this weekend. Sunday was a local bike race - Newmark Center near the Dayton Mall. Put on by Big Dave Sports. Last year at this race I was blown out of the main pack and literally lapped right before the finish (approx 300 yards out). This year a little different. I did screw up and see the 1 lap to go sign but for some reason thought it meant there was one more - not that we were on the last lap. Anyways I was just staying in the group looking forward to kicking it up the last lap and it was over....lol... I missed it - I think I could have easily moved up a good 5-8 positions from where I was... but I wasn't last. I didn't get lapped. I was actually still in the lead pack. Huge difference over last year. Even though I screwed up - I still did good. 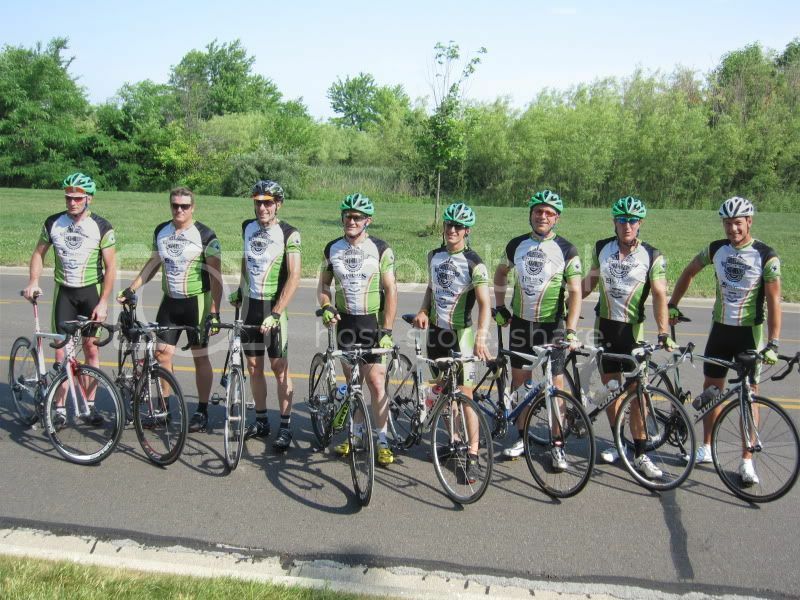 Our Cat5 race completed 18 miles with a 26mph average speed. The other thing I have enjoyed very much this year is that my wife, Carisa, has started road riding. I can't believe how well she is doing. She really seems to enjoy it. And she is very open to suggestions, and making herself a better rider. Yesterday we had gone out for just a neighborhood ride which is approx 20-25 miles and she looks and me as says this is too much fun, let's keep going. We ended up with 61 miles for the day. Went up through Terra Haute, to Urbana (past the 9/11 memorial), back through Northridge (stopped at my sister's house to refuel) headed to the Reservoir and then back up through Tremont City back home. I think we had like 1400 feet of climbing. The funny thing was I was totally content to just ride back Penny Pike (into a head wind) and spin, just relaxing and winding down the ride. When Carisa jumps in front of me and pulls all the way down the road (approx 2 miles) in to the wind at 19-20mph all the way. She is a beast. Yes I did try to hop into the draft... I admit. She makes me so proud! Proud of you!